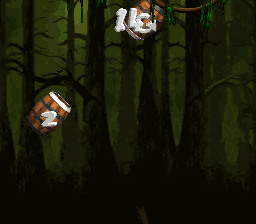 Barrel Bayou is the eleventh level of Donkey Kong Country 2: Diddy's Kong Quest and the first level of Krem Quay. It is the first bayou-themed level of the game. 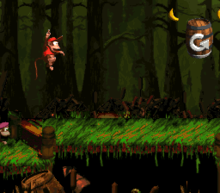 As its title suggests, Barrel Bayou involves Diddy and Dixie Kong using Rotatable Barrels and Arrow Barrels to blast across gaps. Aside from barrel blastting, the Kongs also travel across a series of moss-covered boardwalks throughout. Barrel Bayou is the first level to feature Kloaks, which are hovering enemies that throw projectiles, items, or enemies at the Kongs. 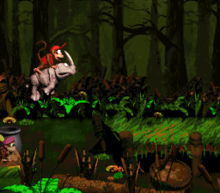 An Animal Crate of Rambi the Rhino appears early in the level. 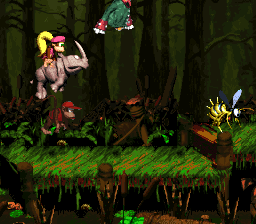 The Kongs can find its crate shortly after the letter K, by jumping over the first Zinger and onto a Krockhead, and then jumping from the Krockhead onto a small boardwalk with its Animal Crate. By freeing Rambi, they can ride up until halfway through the level, where its No Animal Sign appears shortly after the Star Barrel. The music for this and all the other swamp levels in the games are titled "Bayou Boogie". It bears a similarity to Phil Collins's "In the Air Tonight". The composer for the game, David Wise, confirmed that the similarity was intentional. The level begins on a grassy platform with a barrel on it. Ahead, the Kongs can find a trio of Neeks and then a lone Rotatable Barrel with the letter K above it. Some bananas are also to the left and right of the Rotatable Barrel, which only has five seconds set on it. After the primates stay in the barrel past this time limit, it automatically shoots them out of it. A Klomp is nearby, followed by a small area of water with a lily pad holding a DK Barrel floating on it. A Flitter also flies at the end of the water area, and once they cross this water, they make their way down a long platform with a crate-throwing Kloak above it. The Kloak also throws a Banana Bunch if the Kongs wait near it for a while. There is another area of water ahead of here, and it can be crossed with either a group of Rotatable Barrels, each with three to five seconds set on them, or with a Krockhead sticking its head out of the liquid. If they use the Krockhead to cross, they come up to a small platform in the water, which holds an Animal Crate with Rambi in it. Additionally, in the Game Boy Advance version of the game, the heroes collect a photograph if they grab the banana above this Krockhead. A Rotatable Barrel with three seconds on it is to the right of Rambi's Animal Crate, and it can shoot the heroes into a trail of bananas and onto a platform on the other side of the water. The Kongs can find a Zinger on the edge of this platform. A Kloak is near here, and it throws a Zinger onto the platform and then hovers off-screen. If the primates continue, they come up to an additional Zinger that guards a quadruplet of bananas, and then reach a Klobber. A DK Barrel is ahead of here, but before the heroes reach it, they must pass a pair of Kloaks that throw crates at them. After they pass the DK Barrel, they encounter a Zinger that flies over the letter O, which is located above a large pool of water. The group can find a long set of Rotatable Barrels ahead of here, each with only two seconds set on them. As they shoot across the area with these barrels, they come up to a Golden Feather, found only in the Game Boy Advance version of the game. The final barrel can either shoot them onto a long, nearby platform, or into a Zinger guarding a Banana Coin. If they shoot to this Zinger with Rambi, the Animal Friend can slam through the Zinger and safely grab the coin. The heroes land on the platform after shooting to this Zinger, and if they travel forward, they make their way to a second Klobber and a Kloak. The Kloak throws a Banana Bunch and then a Zinger, which lands in front of the Banana Bunch. An area of water is ahead of here, but the group can cross it with the use of three Rotatable Barrels. The first two barrels, both with three to five seconds on them, constantly move up and down, while the last one, with only two seconds set on it, is stationary and placed above a small platform with the level's Star Barrel on it. At this point, the heroes can find a Zinger floating above the water to the right of them. A half-sunken barrel and a lily pad holding a Kannon float on top of the water, and they can be used as platforms in order to reach a platform suspended over the liquid. Two groups of three Neeks walk down the platform, which also holds two Zingers that the heroes must jump over. After they pass the second Zinger, they reach a No Animal Sign. If they reach this sign with Rambi, the Animal Friend disappears and the Kongs are given a DK Coin. An arrow pointing to the west formed by bananas is nearby, being followed by a Kloak that throws some barrels at the primates. If they wait long enough near this floating enemy, the foe heads to the left to the edge of the platform and throws a treasure chest that contains a kannonball. A DK Barrel shakes in the air to the right of the Kloak, and if they travel past it, they find another water area with a pair of Auto Fire Barrels above it. The barrels are placed nearly back-to-back, but are not facing each other. However, they can still be used to cross: If the primates shift to the right after shooting out of the first barrel, they head along a trail of bananas and then into the neighboring barrel, which then fires them to the other side of the water. Here, they can find two Kloaks that both throw Click-Clacks. One of these enemies guards the letter N. After the Kloaks throw a few Click-Clacks, they fly away, leaving the letter N open to the Kongs. Another area of water is ahead, and a Zinger floats above the beginning of it. After they jump over this foe, they land in an Auto Fire Barrel that is placed across from another Auto Fire Barrel in a mirrored position. As before, they must shift to the right after firing out of the first of the barrels to land in the second, which then shoots them to the next pair of Auto Fire Barrels. These barrels are positioned in the same way as the previous and must therefore be used in the same way. After they shoot out of the second of these two Auto Fire Barrels, they land in a lone Auto Fire Barrel that is aimed in the opposite direction that they want to go. By shifting to the right after shooting out of the barrel, the heroes can head in the correct direction and land on a solid area of ground. As they shoot out of the barrel, they also hit into a DK Barrel. Ahead of here, the primates can find two Kobbles and a small pit of water with a lily pad holding a Banana Coin on top of it. 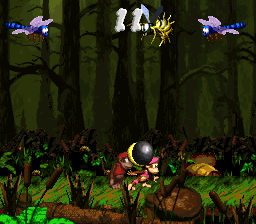 A Zinger hovers up and down above it as well, but once the foe hovers upwards, the heroes can drop onto the lily pad and grab the Banana Coin. On the other side of this small water area, the duo encounters a Kloak that throws a few barrels and a Zinger. An additional water area follows the Kloak, who leaves the area after throwing the Zinger. As the heroes cross the water, they come up to a Banana Bunch and a half-sunken barrel that they must use as a platform. The barrel can help them reach another raised piece of ground, which is immediately followed by a water area with an Auto Fire Barrel hovering across it. Many bananas and the letter G float above this Auto Fire Barrel, which must be used to cross. The barrel is positioned so that it only shoots the Kongs upwards. Therefore, as the device shifts over the liquid, the heroes must move with it and constantly try to land back in the barrel. Soon, they make their way to the other side of the water, where they can find a large platform lifted over the water. A Bonus Barrel is above this piece of land, along with a Kloak, who throws a few barrels and a Zinger at the heroes. After it throws the Zinger, it flies upwards into an area that cannot be accessed. The Kongs can find one last area of water near here, and they can cross it with the use of a barrel floating in it. Once they cross the water, they land in an area with a few Rotatable Barrels, the first two with one second set on them, and the last barrel with five seconds set on it. They can use these barrels to shoot to the End of Level Target found nearby. If they hit this target, they complete the level, but if they hit it immediately after shooting out of the last Rotatable Barrel, they complete the level and win a prize, such as a red Extra Life Balloon. A Zinger hovers around the last Rotatable Barrel, so the heroes must watch for it as they shoot to the End of Level Target. Immediately after passing Rambi's No Animal Sign, the Kongs discover an arrow formed by bananas pointing to the left and a Kloak. If the Kongs wait for a few seconds, the Kloak begins to float to the left. They must chase the villain all the way to the end of the big platform, where it stops and throws a treasure chest containing a kannonball. After they release the kannonball from the chest, they must pick it up and carry it to the left, where a kannon sits on a lily pad. If they insert the kannonball into the kannon, and then enter the object, they are fired up into a Bonus Area. Here, the Kongs have 15 seconds to defeat two Flitters and a Zinger, which are flying high into the air. After defeating every enemy, a Kremkoin spawns on the right side for the Kongs to obtain. Just before reaching the end of the level, the Kongs make their way onto a platform with a Bonus Barrel and the level's final Kloak floating above it. By using their Team-up move, or by bouncing on the barrels thrown by the nearby Kloak, the Kongs can make their way into the Bonus Barrel. The Bonus Barrel then sends them to a Bonus Level, where they must use many Rotatable Barrels, each with only two seconds set on them, to cross a large swamp pit. 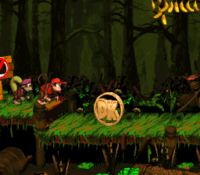 The Kongs have 20 seconds to successfully cross the pit and obtain the Kremkoin from a boardwalk on the right side. DK Coin The Kongs must ride Rambi past the No Animal Sign. 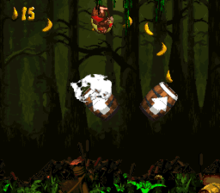 Golden Feather (GBA version) Almost immediately after passing the letter O, the Kongs must blast through six Rotatable Barrels. The Golden Feather is located between the fourth and fifth Rotatable Barrels. Photograph (GBA version) When the Kongs encounter the first Zinger (just before the Rambi Crate), they must jump over it and onto the Krockhead. If the Kongs obtain the Banana above it, they are provided with a photograph. The picture shows a Krockhead on the seventh page of the scrapbook. Above a Rotatable Barrel at the beginning of the level. Near a Zinger after the second DK Barrel. By a Kloak, who will move away if the Kongs wait for a bit, after the No Animal Sign. Reached with an Auto Fire Barrel after the second Bonus Barrel. This page was last edited on April 6, 2019, at 01:53.